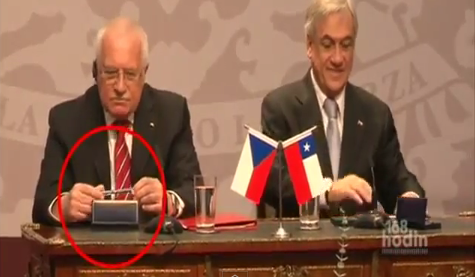 President of Czech Republic Václav Klaus slowly, carefully and masterfully drops this “gift” into his pocket during an official visit to Chile. This thing has blown up today, jumping from 400,000 to nearly 4 million views in less than 24 hours. Although most people aren’t being videotaped by the world’s press while they do it!